Recently, I read this article about one mother’s self-imposed challenge not to spend any money on children’s products for a whole year. I found it very interesting, and was impressed with some of the solutions she found to make it through the year and still clothe, feed and entertain her child. After a (very) quick discussion with Stonelaughter, we’ve decided to do our own take on this. We’re not going for a spend-free year (and if you read the article, you’ll see that Hattie won’t be continuing spend free after her year is up), but we think we can take some of the lessons Hattie has learned and decrease spending over the year. So, where to start? We don’t buy children’s foods particularly, with the exception of some oat bars for PK (which the other two had when they were babies too), so we don’t have much to do there. Toiletries. Well, there’s a topic. At the moment, PK and Plum share a toothpaste. Bean has a different one. Stonelaughter and I both use different ones. That’s 4 tubes of toothpaste between 5 of us. Hmn. We can change that then. And although we buy those “gentle” children’s bubble baths and shampoos, when you actually look at them, they’re full of chemicals anyway, so what are we paying for? We can change something there. Clothes can be a huge expense when you have children. Bean seems to grow about an inch a week, and he outgrows jeans before he gets much wear out of them (though now he doesn’t have a school uniform to wear, he gets more wear out of his clothes, thankfully). 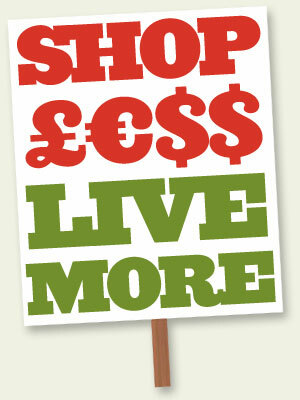 We’ve never been into designer clothes, for us or children, so don’t spend a fortune on clothes, but it all adds up. If my children aren’t getting wear out of their clothes, then it stands to reason that other children are not, so I’m going to hit the charity shops and Freecycle next time one of them needs some thing (though they all had clothes at Christmas so shouldn’t need anything soon). We already send plenty of their outgrown stuff this way, so it makes sense to see if we can benefit that way too. And then there’s toys. We have lots of them. Plenty of them have been passed from Bean, to Plum, to PK (and there’s a very popular, noisy train that came to Bean via a charity shop and is still going strong now Plum has given it to PK). We sent lots of toys to the charity shop last month, but of course with two birthdays and Christmas last month, there were plenty of new ones arriving too. Bean’s birthday is at the weekend, but once that is over, we’ll be using what we have, not buying more. They all three love being creative and cooking and such anyway, and play best when they are being imaginative. What other areas can be cut back on? We’ve never been into lots of “gear” for babies, finding most of it unnecessary at best. Entertainment wise, we don’t go to soft play and such very often, but I will still continue to take the children there and I will still continue to pay for Plum to go to ballet and tap classes and for Bean to go to Cubs and Judo. What do you think – are there any areas you would cut back on, some that you wouldn’t consider spending on, or any you wouldn’t consider cutting back on? I’d love to hear what you think. I don’t really have the money to begin to buy half of the things that she’s cutting back on – but even when I did I still didn’t buy special food for children, for example 😉 What saddens me is that we live in a world where what that woman is doing is considered A Big Deal – very sad. The reality for many families is that they are already doing these things anyway – I honestly didn’t realise it was such a big deal. However, I think activities such as ballet and cubs, etc, are a different thing, being a valuable experience on a rather different level to designer clothes or new toys and although we’re on a fairly low income, I do think these things are important (and is one area that I wish we could do more on – as I’d love for Nin to have guitar lessons, for example). That was a very interesting article! Not a lot to cut back on here… We do buy rusks but we all enjoy them, and I do use disposables – cloth didn’t work out for us and we use sainsbury’s budget range ones which amounts to about £3 a week which is equal (possibly less) to the weekly washing machine & tumble dryer energy for cloth (no outside drying space here), never mind the actual initial outlay. With seven kids and many friends and a lot of extended family we don’t buy a lot of clothes or toys, they all get passed down and along and around, and we utilise charity shops and supermarket sales, coupons and deals for anything we need, wants are full filled with birthday and christmas presents. We do a fair amount of activities – karate, ballet, swimming, cricket, tennis, football – but then that’s more the older ones, not every one does everything, and as we home educate that’s how we full fill some curriculum needs. My mum likes sponsoring them in things like that and we’ve also been very lucky in getting sibling discounts and scholarships.